The five SOF Truths have been a basic guide for special operations forces (SOF) when conducting daily activities as well as long-range planning. Additionally they are helpful to members of the Department of Defense, other organizations and agencies of the U.S. government, and conventional force leaders and staff – informing them of the differences between SOF and conventional forces. It takes years to train operation units to the level of proficiency needed to accomplish difficult and specialized SOF missions. Intense training – both in SOF schools and units – is required to integrate competent individuals into fully capable units. This process cannot be hastened without degrading ultimate capability. The operational effectiveness of our deployed forces cannot be, and never has been, achieved without being enabled by our joint service partners. The support Air Force, Marine and Navy engineers, technicians, intelligence analysts, and the numerous other professions that contribute to SOF, have substantially increased our capabilities and effectiveness throughout the world. In 1991 Baratto briefed the SOF Truths to Wayne Downing, the commander of the Army Special Operations Command (USASOC) and he was receptive to the concept. The five SOF ‘findings’ are found in the foreword (see page V) of the report wrote by Congressman Earl Hutto (D.-Fl. ), Chairman of the Special Operations Panel, House Armed Services Committee. See United States and Soviet Special Operations, Congressional Research Service, April 28, 1987, Government Printing Office, (Washington: 1987). 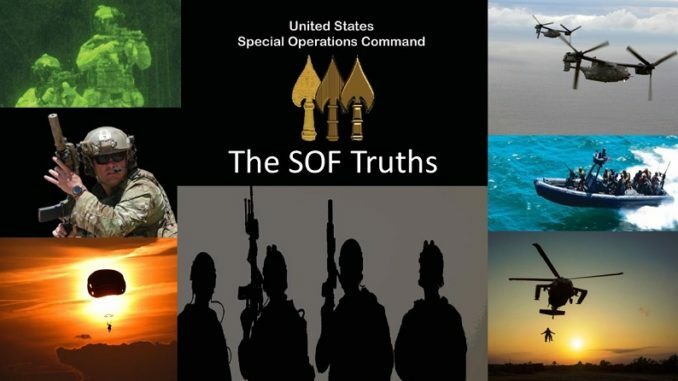 For a brief history of the five SOF Truths read “The Special Operations Truths”, Weapons Man, January 27, 2012. The blog about Special Forces and the world of weapons was authored by Chris Ryan – a former SF Weapons NCO until his death in 2017. The 5th SOF Truth was rehabilitated by Admiral Eric Olson, commander of the U.S. Special Operations Command (USSOCOM) in recognition on SOF’s need for support by it’s conventional force partners. This fifth truth had gone unrecognized for over 21 years. Source is a news article by Sean D. Naylor published by Army Times posted on NAVYSEALS.com – “Adm Olsen Adds “Lost” 5th SFO Truth to Doctrine”. COL (Ret) John Collins describes some of his work while a researcher for Congressional Research Service (CRS) and how he penned the SOF Truths in a report to Congress. See “The Warlord on Special Operations Forces”, War on the Rocks, September 10, 2013.